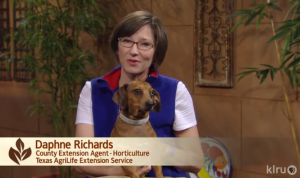 Hi, I’m Daphne Richards, county extension agent for horticulture at the Texas A&M AgriLife Extension Service office for Travis County. My primary responsibilities are administering and developing the countywide Master Gardener program, coordinating and implementing various horticultural education programs and outreach, and increasing overall horticultural awareness. As a contributor to Central Texas Gardener (CTG), I love to answer your questions and share knowledge on new and tried & true plants for our area. Here are some Flashback Favs!